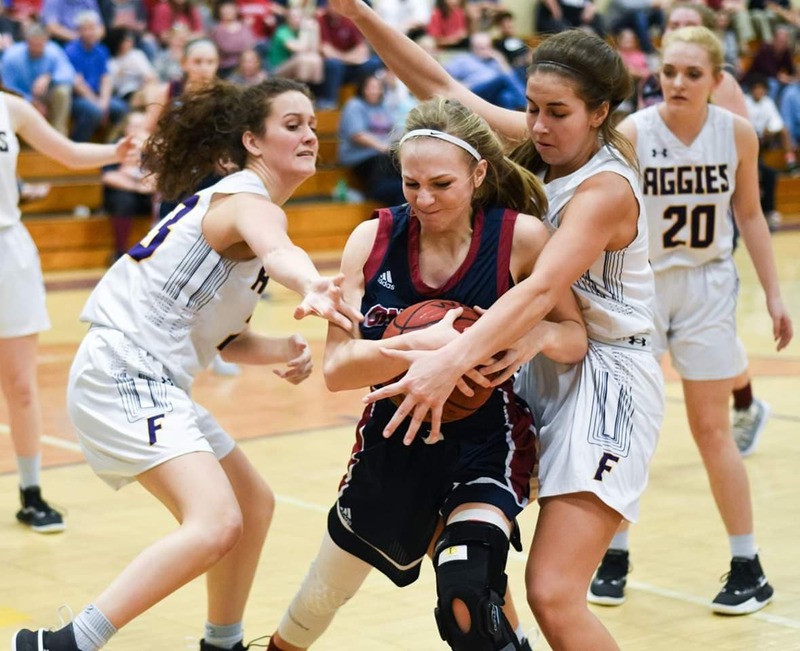 FAIRVIEW – The Fairview Lady Aggies looked for their third straight area championship and their first under head coach Justin Billings when they took on Oneonta Thursday night. Both teams split their regular season match-ups, but this one had a lot more on the line, a chance to host a sub-regional game. The game started out with both defenses on top of their game as there were a combined 12 turnovers in the quarter. Fairview was held without a basket for almost six and a half minutes but got their first basket off an Oneonta turnover when Katie Ball got the steal and found Payton Golden for the layup. Later, off another Lady Redskins turnover, Ball hit a layup to tie the game up at five after one. The Lady Aggie defense continued to suffocate Oneonta in the second period and the offense caught fire as they scored the first eight points of the period to take a 13-5 lead. Later in the second, three-pointers from Morgan Lindsay and Molly McKelvy helped stretch the lead to 24-10, but Oneonta cut into that lead and made it a 24-16 score at the half. Ball hit a three to start out the third period to push the lead back to double-digits at 27-16, but the Lady Redskins took over after that, scoring the final 11 points of the quarter to tie the game at 27 going into the final period. Both teams swapped leads throughout the fourth quarter. A McKelvy three gave the Lady Aggies a 30-27 lead, but Oneonta re-took the lead with back-to-back treys. Ball scored the next four points to give Fairview a 34-33 lead, but later, a three-pointer plus a pair of free throws by Oneonta gave the Lady Redskins a 38-35 lead. Fairview cut it to 38-37 on a Maddie Yeager shot but the Lady Redskins added two more shots from the free throw line to make it 40-37, leaving the Lady Aggies with one more chance to tie the game. Golden went down low looking to hit a layup or get fouled, but the ball was deflected out of bounds as time expired and Fairview came up just short at the end, 40-37. Ball finished the game with nine points, two rebounds, and six steals for Fairview. Golden added eight points, two rebounds, and five steals. McKelvy ended up with six points and two rebounds. Yeager (10 rebounds and two steals) and Gorham (steal) each added five points. Lindsay chipped in with three points, and Daisy Manasco added a point. The Lady Aggies (17-10) will travel to North Jackson for their sub-regional game Monday night at 7 p.m.